Do you have heartburn? I will teach you how to stop acid reflux. Let's start with why you have heartburn while your friends haven't. If you are like me, you like to know what you've got. It's only after you've completely understood your problem that you can deal with it. Do you suffer from gastric reflux after meals? Have you got troubles sleeping because of acid acid reflux at night? Does your stomach bother you during a work-out? Come on in! You're in good company. Are you a future mama who has just discovered the annoying feeling of heartburn during pregnancy? Welcome aboard! Does your crying baby drive you mad? Did you know that acid reflux is an important cause of colicky babies? …I've found a way to crack the code! There aren't any big secrets involved. Your symptoms won't magically disappear after reading this website. You will have to take action! What you can expect are information and tools to combat acid reflux. Start eating differently. Discover how to stop acid reflux at night. With small steps and some discipline you can make yourself better. Sit back, relax and stop your acid reflux! what are the cures for stopping acid reflux? 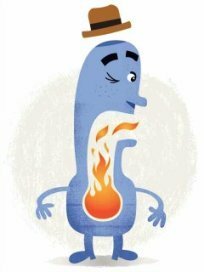 If you suffer from acid reflux, take your condition seriously. You are at risk of developing Barretts Esophagus, which is a first stage before esophageal cancer. If you haven't seen your doctor yet, that's the first thing you should do! So start taking action instead of endlessly waiting until symptoms disappear!